On 20 November 1914, the Hartlepool trawler Doris Burton left Aberdeen and vanished. She was heading home, fishing on the way, and was expected to land her catch at Hartlepool in a few days. For the past three weeks she had been based at Aberdeen ‘short tripping,’ spending two or three days at sea, fishing, and then landing her catch at the city’s fish market. 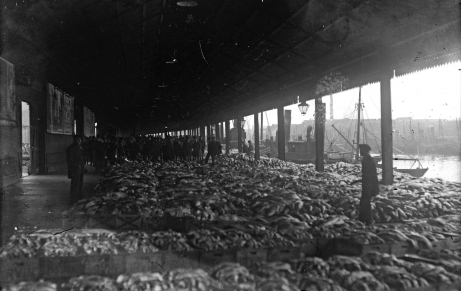 This allowed her owners to profit from the high fish prices caused by restrictions placed on fishing operations by the Admiralty after the outbreak of war. She was a new trawler that had been built in Aberdeen by Hall Russell & Co and delivered to her owners, the newly formed Doris Burton Steam Trawling Company Limited, in May 1914. She was the keystone of R. H. Davison’s plans to establish a new steam fishing company at Hartlepool. The company, and the trawler, was named after the six-year-old daughter of W. S. Burton, a fish merchant and poulterer, of Norton-on-Tees, who was one of Davison’s main backers. The company bought two more new trawlers from Hall Russell: the Kathleen Burton, (1914) and the W. S. Burton, (1917) both named after Burton’s children. There are photographs of the Kathleen Burton and possibly of the W. S. Burton on the Hartlepool Then and Now website [link below]. Typically for a trawler of her size, the Doris Burton had a crew of nine and, like all steam trawlers, her crew was divided between fishermen and others. This was a traditional and administrative division and the four fishermen on board the Doris Burton all came from Scarborough. The Hartlepool trawling fleet grew rapidly from 1900 onwards and Scarborough, an old established trawling port in relative decline, was a ready source of experienced crew for Hartlepool boats. John William Truefitt, the Doris Burton’s Skipper, was born in Scarborough in 1874 and was the son of Burton Truefitt, a fisherman, and his wife Mary. In 1902 he married Maria Jenkinson, from another seafaring family, and probably began skippering Hartlepool trawlers in 1904. The Burtons were living in Durham Street, Hartlepool, by the summer of 1913 when John William was skipper of the trawler Loch Garry. He probably needed little persuasion to move to the new and larger Doris Burton. One member of the Truefitt family, possibly John William’s younger brother, Burton, who was also a trawler skipper, bought one fifty-pound share in the new trawler. At the time of his death, John William’s family was living at 23 Durham Street Hartlepool. Absalom Cave, the Doris Burton’s mate, had over 30 years’ experience as a fisherman and had been living in Hartlepool with his wife and family since 1911. William Reynolds, trimmer, was a fisherman with over 20 years’ experience and lived with his wife, Elizabeth, a fish hawker, and their family in Scarborough. (A trimmer was a stoker who also had responsibility for storing the trawler’s catch.) Robert Jowsey, deck hand, had been fishing for 12 years and was living with his sister in Scarborough in 1914. He had joined the crew at the last minute when his nephew, Levi, pulled out. Nothing was heard of the Doris Burton after she sailed and, at first, it was hoped that she had been delayed by bad weather. Her owners could not contact her at sea because she was not fitted with a radio. Generally, owners kept in touch by telegraph when trawlers were in port and relied on ‘sightings’ by other fishing boats when they were at sea. Some trawlers were fitted with radios in 1917 as part of the campaign to reduce losses from U-boat attacks, but their use wasn’t widespread until the 1920s. As the days became weeks, rumours circulated in Scarborough and Hartlepool about the Doris Burton’s fate. R. H. Davison & Company, the Doris Burton’s managing agents, would not accept that she had been lost due to bad weather, pointing out that she was a large up-to-date craft. They agreed that ‘it was not impossible’ that she had been captured and her crew were prisoners of war, but claimed that the most likely explanation was that she had hit a mine. The Scarborough press agreed and on 24 December the Scarborough Weekly Post claimed ‘she had been sacrificed to German mines.’ For the owners, it was important to set the agenda on how the Doris Burton was lost because this would have a material impact on their insurance claim. At the beginning of the first week of January 1915, hopes were revived that the crew might still be alive, with the news that the crew of the Grimsby trawler Manx Queen, believed to have been sunk by a mine, were prisoners of war in Germany. Notwithstanding this, the Doris Burton was officially deemed to have been lost on 8 January 1915. ‘Ship missing since leaving Aberdeen, 21 November 1914 certificate with vessel’ was the entry made in the Hartlepool Register of Sea Fishing Boats. All hope was lost three weeks later when a Danish vessel on-route between Blyth and Odense found the Doris Burton’s overturned life boat 155 miles north east of Hartlepool and there could be no further doubt that she and her crew of nine were lost. •	Absalom Cave (47), Mate, originally from Scarborough, but living at 73 Cleveland Road Hartlepool in 1914, married with eight children. •	Jacob G. Cole (22), Third Hand, originally from Staithes, but living in Graham Street Hartlepool in 1914, married with one daughter. •	Robert Jowsey (29), Deck Hand, from Scarborough, living in Parkin Lane, Scarborough with his sister in 1914 and unmarried. •	John C Mansfield (16), Deck Hand, from Scarborough but living in Durham Road Hartlepool in 1914, unmarried. •	Thomas Leslie Harwood (16), Cook, from Scarborough and living with his grandparents at 5 Merchants Row Scarborough in 1914, unmarried. •	Thomas S. Coulson (37), Engineer, from South Shields and living in Durham Street Hartlepool in 1914, married with one son. •	Hugh Hawthorn (39) Second Engineer, born at Bangor, Ireland and living at 22 Warren Terrace Hartlepool in 1914, unmarried. •	William Reynolds (39) Trimmer, from Scarborough and living at 5 The Bolts, Scarborough in 1914, married with five children. All the crew are commemorated on the Tower Hill Memorial in London, which commemorates those from the Merchant Navy and from the fishing fleets, who were lost at sea during both world wars. The story of the trawler that disappeared was reported widely in the north of England and Scottish press. It touched the prevailing mood of uncertainty about the war and the sudden and unexplained loss of nine men and boys was keenly felt, as public sympathy had yet to be numbed by mass casualties on land and sea. Was this how the war at sea was to be fought, with boats and ships disappearing without trace? The Bombardment of Scarborough, Whitby and Hartlepool on 16 December did change the public mood, but the trawlerman were not forgotten. On 18 March 1915 a public meeting was held in the Free Library, in Hartlepool, to raise funds for the dependants of the crew – it is not known how much was raised. The families were entitled to compensation but it took nearly a year for it to be paid, by which time some were almost certainly in debt. In October 1915 Mary Coulson claimed the £300 that had been paid into the County Court and asked the court to apportion it between her and her son, Robert, who was an apprentice draughtsman. The court awarded her £275 and £25 to her son to be paid at £1 per week. John Hawthorn, in his mid-sixties and a labourer in the town’s cement works, was awarded £132 13s for the loss of his son, Hugh, and the full sum was paid to him. Grants were also paid from the Mayor’s Local War Fund: Ethel Cole was awarded £15, Maria Truefitt £15 10s and Mary Coulson £10 10s. For those women with large families – Lavinia Cave, Maria Truefitt and Elizabeth Reynolds – left without the families’ main breadwinner, their lives were a continuing struggle to avoid destitution. If they were lucky, some children could be sent to stay with other family members until they were old enough to earn a wage or join the forces. Received opinion is that the Doris Burton was sunk with all hands due to a mine explosion – but no proof has been found to support this. Recently some wreck enthusiasts believe they may have found the wreck of the Doris Burton with its stern blown off, but the evidence is not conclusive and the mystery of the trawler that disappeared continues. 1911 Census of England, Wales and Scotland. 1901 Census of England, Wales and Scotland. 1881 Census of England, Wales and Scotland. Durham County Record Office, BT/F 29-58, Board of Trade Fishing Boat Running Agreements. Teesside Archives, NG/SR/WH/3/2 Register of Sea Fishing Boats Hartlepool. TNA, BT 31/32181/135379, Doris Burton Steam Trawling Co. Ltd.
TNA, BT 334 Deaths at Sea. Malcolm Cook, Fishing in Hartlepool, (2011).